Jackets are an invaluable piece of riding equipment for keeping riders warm and comfortable in cold weather and dry when it rains. But special riding jackets are needed, as ordinary jackets do not benefit from the many features which manufacturers are now putting into special riding ones. Riding jackets also have a role to play in terms of appearance. Smart, tailored riding jackets are necessary, and usually compulsory, for competitions. To this end, most riders will have at least one casual and one smart jacket, but most will have more. For everyday riding and hacking, you will need a good quality riding jacket. A cagoule may keep you warm and dry but nothing beats a proper jacket designed for the job. Riding jackets are styled differently to normal jackets to allow the rider plenty of freedom. The shoulders are usually cut wider for ease of movement of the upper back and arms. 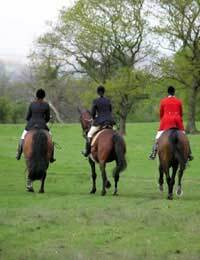 There is also usually a vent in the back of the jacket to allow it to sit over the saddle, rather than the rider having to sit on their coat tails. It is best to choose a riding jacket with reflective strips and patches on it – this is particularly important if you plan to ride out on dull winter evenings. When riding, it is always a good idea to wear layers under your jacket then you can strip them off as required. For this reason, always buy a riding jacket which is made of a breathable material. It will stop you from getting too hot and bothered as sweat will be able to evaporate. But also make sure your jacket is waterproof and lightweight – it is not a pleasant feeling to be bogged down by a wet and heavy jacket. Lots of riders choose to wear gillets. They offer warmth and dryness without the restriction of something covering the riders’ arms. Formal jackets generally fall into the categories of show jackets and hacking jackets. They look smart in competitions and are required wearing in most. These are not jackets worn for practical reasons but it is still important to make sure yours is cut to allow your arms freedom to move. They are usually worn with other smart attire including stock and tie. Hacking jackets are often made from tweed, and, as such are fairly heavy and warm. They still have vents in the back to avoid sitting on your coat tails and some have side vents too. The heavier jackets will be very hot so if you are competing in the summer and have to wear one, you should try to find a summer version of your winter jacket. Show jackets are more formal than hacking jackets. They are not usually made of tweed but will be cotton and polyester mixes. They usually come in dark colours as this is required for shows. Quite often, the jackets will have elaborate details such as ornate buttons and velvet collars. It is fairly unique to wear such formal clothing for competition in a sport, but it is what is deemed necessary by the ruling bodies of equestrianism. The vast majority of competitions require a jacket of some description – usually in navy blue or black. Some have restrictions on details such as colour so, along with the less formal jackets, you will probably find you have the need for several different riding jackets. Certainly in terms of casual jackets, they will enhance your experience and make riding more fun, while formal jackets will help you to feel the part and look professional.